HAMILTON - Rookie quarterback Vernon Adams threw three touchdown passes in just his third CFL start to lead the Montreal Alouettes to a 32-25 win over the Hamilton Tiger-Cats on Saturday at Tim Hortons Field. Hamilton (7-11) has lost its last two games but is in the playoffs - hosting the Edmonton Eskimos next week in the CFL East semifinal. Montreal improves to 7-11 with its third win in a row, but had been eliminated from the playoffs by virtue of having a worse record than Edmonton, who finished fourth in the West and crosses over. 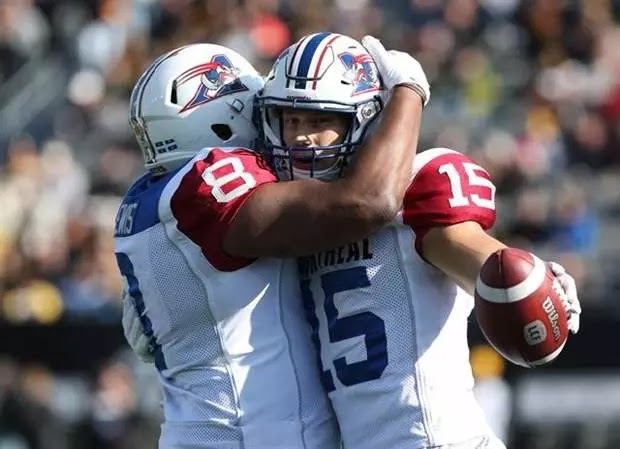 Despite sharing the same record as Montreal, the Ticats head to the playoffs because they hold the tiebreaker with two earlier victories against the Als. Samuel Giguere scored twice, B.J. Cunningham scored once and Stefan Logan added a punt return TD for Montreal. Brian Tyms and Anthony Woodson each scored for Hamilton. Hamilton kicker Brett Maher made all three of his field-goal attempts, from 25, 43 and 51 yards out. Montreal kicker Boris Bede hit his lone field-goal attempt, from 16 yards. We in the CFL East Division play-offs! Rough loss for the lowly ticats today... they are surely in tough next week when the eskimos will invade their frugil cookie cutter of a stadium that is Tim Horton's field. Looks like a grey cup rematch in the east division final.